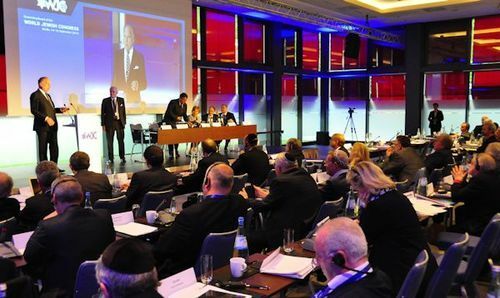 Leaders of Jewish communities from around the world will gather in Rome next week for a meeting of the World Jewish Congress’ (WJC) Governing Board. On Tuesday, 27 October 2015, nearly 150 delegates and guests will discuss the situation of Jews around the world, as well as the current tensions in the Middle East, the refugee crisis in Europe and the Iranian threat. The following day, Pope Francis will receive the WJC leadership on the occasion of the 50th anniversary of the Vatican’s landmark declaration Nostra Aetate, which will be followed by a press conference by WJC President Ronald S. Lauder. The Governing Board meeting will be chaired by David de Rothschild and attended by 150 heads of Jewish communities, delegates and young Jewish diplomats from around the world. Discussions will focus on the implications facing Jewish communities in light of the various conflicts in the Middle East, including the threat of jihadist terrorism, the aftermath of the nuclear agreement with Iran, the growing attacks on Israel by the Boycott, Divestment and Sanctions (BDS) movement, and the state of relations with other faith communities. The WJC will be marking the 50th anniversary of the Nostra Aetate declaration, drawn up by the Second Vatican Council and promulgated by Pope Paul VI on 28 October 1965, condemning anti-Semitism and markedly improving relations between Jews and Catholics. On the anniversary of this important event, WJC delegates will take part in a public audience with Pope Francis on St. Peter’s Square. Prior to that, the Catholic pontiff will receive WJC President Ronald S. Lauder in a private audience.